Gigantic fun for kids of all ages. Great cooperative group play. Helps to build muscle tone. Fun at birthdays, picnics or anytime. There are over 100 different games a child can play using this “Kaleidochute”. 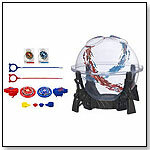 Develops perceptual, cognitive, motor and academic skills. A must have item for every child. Comes with its own carry bag. Durability and the opportunity to teach about colors. Great cognitive challenges plus movement and cardiovascular benefits. Bag with a flat bottom and super stitched seams. Kangaroo pocket for essential game storage. Long, reinforced handles. Set of four sacks. 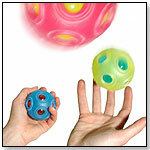 Stimulates your child’s imagination while keeping them busy and active. 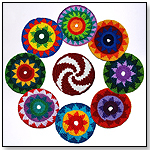 Handmade of soft, fair trade cotton, the PHD Pocket Disc is ideal for throwing indoors or out. Stuff it in your pocket or pack, it's easy to throw and catch for ages 3 and up. 8" diameter. Roll the die and strategically eliminate other players by Squashing them one pawn at a time. Or, flip the cube for a total wipeout. Be the last pawn on the Squashed™ cube to win. Invented by ChiTAG Young Inventor Challenge Winner, Nicholas Metzler, when he was just sixteen. SUSHI STAX™ is the new fast-paced game that combines the fun of stacking with the unique challenge of using chopsticks! Incorporating the trendiness of sushi into a fun and challenging game, SUSHI STAX has players racing to build and balance a variety of sushi towers using only chopsticks or tongs to lift each piece! With various configurations on different cards, players must carefully balance the need for speed with precision and accuracy so that their pieces don’t come tumbling down. Launch date: May 2013. HOOK IT! LAUNCH IT! CATCH IT! Djubi Classic is the coolest new twist on the game of catch. A unique combination of a slingshot and lacrosse stick, Djubi Classic consists of a specially designed racquet with a net and launch hook and a ball with an elastic band. Djubi balls can be launched up to 100 feet and they’re easy to catch with the Djubi racquets. Fathers and sons, college students, families and friends will find that Djubi Classic will take the old game of catch to an awesome new level of fun and excitement. It’s a pack of stamina, defense and more defense with the Legendary Bladers: Descendants 3-pack set of spinning battle tops. In the stamina column of this trio of fierce Beyblade tops is the Scythe Kronos T12EDS top, with a Spin Track part whose Tornado design helps create a sustaining vortex. Its Eternal Defense Spike Performance Tip part is for stamina and defense. Create custom top combinations by switching parts, and may the best top win. 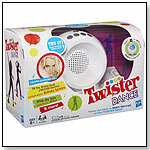 Rock the spots to today’s hottest music with the Twister Dance Game. Learn dances by following the Twister spots to songs like "Till the World Ends" by Britney Spears or "Whip My Hair" by Willow. Or kids can dance to their own music by connecting the game to any MP3 player (sold separately). Booster Packs are blind packs that each contain 9 cards - plus a code card in each pack. Launch date: November 13, 2012.
cards total plus a code card. Launch date: November 13, 2012. It's time to take N-STRIKE battling to the next level with the HAIL-FIRE blaster. 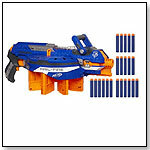 The HAIL-FIRE blaster's unique rotating ammo rack gives it the highest capacity of any NERF blaster. The HAIL-FIRE blaster comes with 4 Quick Reload clips and 24 Elite Darts, but it can hold up to 4 more Quick Reload ammo clips and up to 144 darts. The blaster's acceleration trigger powers up the motor for semi-auto blasting that lets users unleash a storm of revolutionary Elite Darts at targets. Fire at targets up to 75 feet away. The Quick Reload clips work with any Clip System blaster (sold separately) and the Elite Darts work with any Elite blaster and most original N-STRIKE blasters (sold separately). With 2 tactical rails that are compatible with most N-STRIKE accessories (sold separately) and an advance handle, this blaster gives users the ultimate in Elite customization and firepower. Kids load their micro racers in the four lane charger...It's four times the action, four times the fun. Race around the corners, and over the cross bridge. 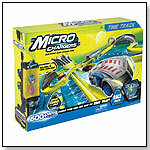 Complete with a timer controlled finish, the Micro Chargers Time Track is the ultimate in racing. The Time Track comes with 2 x Exclusive Quick Charge Micro Car(colors vary), 1 x Time Race Track, 2 x Stats Card. 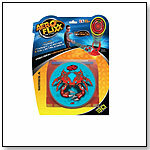 Aero Flixx is an indoor action disc game. The 4 inch discs contain cool 3D images on 1 side and a foam backing on the other. Initially, there are 40 discs to collect and trade. A rubber band powered target is available at which the discs are tossed and a direct hit propels the target 5 - 6 feet in the air. 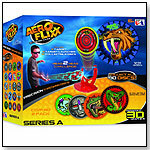 Play indoor disc golf, H*O*R*S*E, shooting gallery, or other precision games using Aero Flixx' 3D throwing discs, target and target launcher. This all new Wobble Deck is an electronic balance board that features four fun balance games that challenge the mind and body. Games include: Copy Wobble, Memory Wobble, Wobbly Statues, and Musical Wobble. Base detaches to become a portable handheld game. Fun for the whole family. Skate indoors year-round. Carpet skates work on any type of carpet for a fun-powered glide. Strap them on and slide away. If you've got carpet, you've got fun. One size fits all. Ages 6+. Recommended for use with The Carpet Puck. Launch date: 2012. Cluck 'N' Chuck is a game that’s bursting with fun – and chickens! This game for two to four players will leave kids in hysterics as they try to contain runaway chickens. Players roll the die to see which chickens they can chuck into the coop. But move quickly before the coop jumps up and they all fly out. It’s a race to see who can round up their chickens first in this rowdy cluck-cluck game. For ages 4 and up. Don’t Rock the Boat will have kids channeling their inner pirates without fear of having to walk the plank! The play pieces for this game are fun pirate penguins, and play takes place aboard their pirate ship. Take turns trying to balance the pirate penguins on the ship, but if you rock the boat and send some mateys overboard, ye be a loser! For ages 5 and up. Launch date: 2012. Super Shooter Basketball is for one or more players. Shoot hoops with the miniature basketballs and gain mad skills! The game includes rules for three well-known games. Super Shooter Basketball is for ages 5 and up. Launch date: 2012. XaXa (pronounced "Ksa·Ksa") is designed to stimulate the senses. It's for playful, curious people, jugglers, dancers, performers – for kids of all ages. The adaptable balls invite kids to experiment and explore: Fill them with different objects to change their sound or weight and mix or match colors to get the look they like. The core of XaXa is made of shock-resistant, clear plastic that is protected by a super-elastic rubber skin. This soft skin makes the balls pleasant to touch and easy to catch. It is so stretchy and durable that the core can easily be popped out of one of the holes.